If we look at the sky, we can see so many shapes of clouds in it. 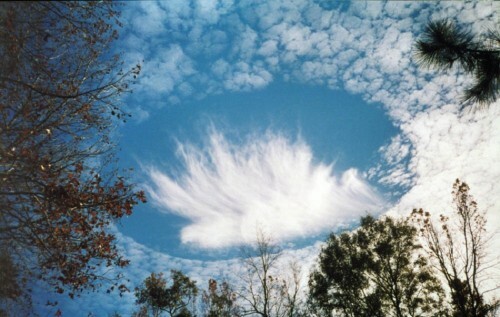 The clouds not only entertain the children, but also becomes a challenge to the scientists. There were three clouds seen in sky near Myrtle beach, California. They were round, astonishing and looked as though formed suddenly and all the spectators were surprised. Somebody told that they are formed by the vehicles of aliens. It is known that there are assumptions and beliefs that aliens will travel on strange objects. They are called flying objects and UFO (unidentified flying objects). It became a sensation as these clouds are also formed in the same way. Some people took the photographs and kept in Internet and lakhs of people saw this. In fact these types of clouds are forming from decades in several places. There are many theories on that but no one explained it completely. So at that time, the scientists noted the temperature of the clouds, the environment on that day and researched about it and disclosed a reason. Those clouds are named as Hole Punch clouds. That day, at approximately 9000 feet height, at the place where clouds are formed, the temperature was minus ten degrees. Generally at that temperature smallest water drops will become solid and ice is formed. But if sometimes there are no dust cells which help to turn it to solid state, it stays like that even at minus 36 degrees temperature. At that time, if any aero planes go on the clouds, due to the movements it becomes more chiller. Immediately in that place smallest water drops becomes solid. If they are seen from earth it looks like a flying saucer. Before the formation of the clouds, it was learnt in research that three military aircrafts had gone side by side at same time that is how clouds were formed.